New scarves and sarongs for April 2007. "Turquoise" Swirl This pretty tie dye sarong with lots of blue turquoise color is great for a day at the beach, pool, lake or wherever else your heart desires. Sarong measure approximately 66 x 44 inches (168 cm x 112 cm) on fringed lightweight rayon. Tie Dye Sarong "Blue-Turquoise Nebula" This beautiful tie dye sarong is way cosmic. Sarong measure approximately 66 x 44 inches (168 cm x 112 cm) on fringed lightweight rayon. Please note color, size, and design will vary due to the handmade nature of this item. Tri Dye Sarong "Turquoise" Another beautiful tie dye sarong from the island of Bali. Sarong measure approximately 66 x 44 inches (168 cm x 112 cm) on fringed lightweight rayon. Please note color, size, and design will vary due to the handmade nature of this item. Sarong "Brown" Smoked PLUS SIZE This beautiful brown plus size sarong has a "smoked" design which adds a little flavor to a solid color. Sarongs can be used as a skirt, bathing suit cover-up, scarf, shawl, fabric for fashion design, wall hanging, home decor and more. F.Y.I., "Smoked" is a dyeing method that creates a very eye-catching attractive design. Sarong measures approximately 98" x 46" inches on fringeless lightweight rayon. Photo is a close up. Please note color, size, and design will vary due to the handmade nature of this item. "Sparkles" Sarong Fun and colorful "Sparkles" sarong. Sarong measures approximately 66 x 44 inches (168 cm x 112 cm) on fringed lightweight top quality rayon. Please note color, size, and design will vary due to the handmade nature of this item. Woven Scarves with Gold Thread (6 per package) Exotic scarves imported from far off Southeast Asia will make a first class fashion accessory and will add a touch of elegance to your day or evening attire. Scarves measure 60 x 21 in. on fringed top quality fabric. Quantity of 6 per package. 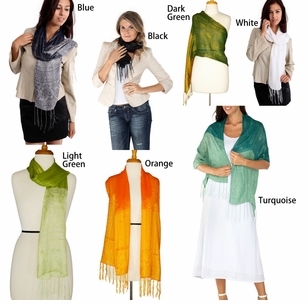 Solid Colored Gauze Scarves (6 per package) Beautiful vibrant colored gauze-like scarves. Fun as a scarf, sash, head wrap, etc.! "Black, Blue, Dark Green, Lime Green, Hot Pink, Orange, Purple, Turqoise, White and Yellow" Fringed scarves measure 63 x 20in. (155 x 51cm). 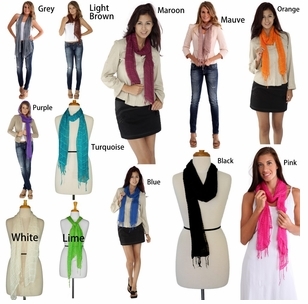 Assorted scarves. Quantity of 6 per package. Tie-dye Gauze Scarves (6 per package) Add some fun to your wardrobe with these playful tie-dyed scarves! Can be worn many different ways as a cool fashion accessory. Fringed scarves measure 63 x 20in (155 x 51cm). Assorted scarves. Quantity of 6 per package.